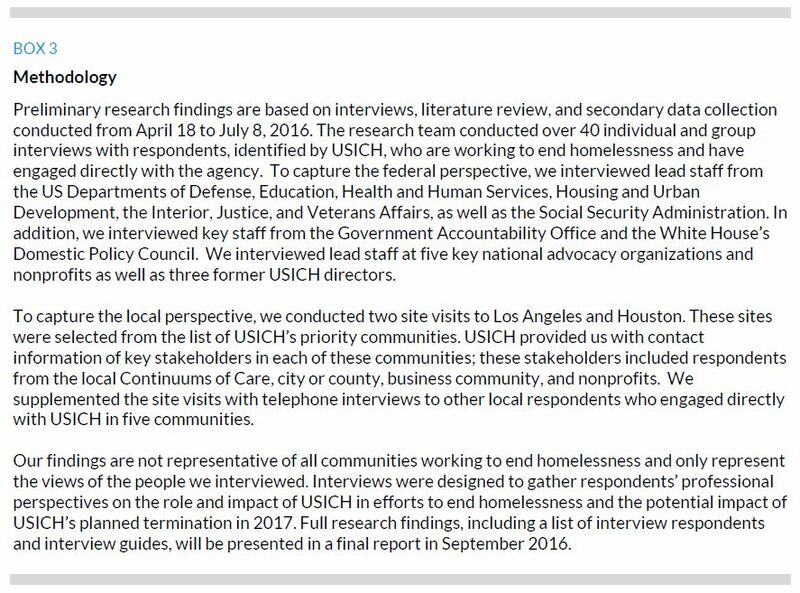 To understand the US Interagency Council on Homelessness’s (USICH’s) role in the nation’s efforts to end homelessness and potential effects of the agency’s planned termination in 2017, we interviewed more than 40 federal and local stakeholders across the public, private, and nonprofit sectors. Tasked with coordinating the federal response to homelessness, USICH is perceived as uniquely positioned to help federal, state, and local actors achieve the nation’s ambitious goals. Overwhelmingly, stakeholders considered USICH an important part of a highly effective performance-driven partnership and argued that terminating USICH could slow down efforts to end homelessness. How Would Terminating USICH Affect Efforts to End Homelessness? To understand the US Interagency Council on Homelessness’s (USICH’s) role in the nation’s efforts to end homelessness and potential effects of the agency’s planned termination in 2017, we interviewed more than 40 federal and local stakeholders across the public, private, and nonprofit sectors. Overwhelmingly, stakeholders considered USICH an important part of a highly effective performance-driven partnership and argued that terminating USICH could slow down efforts to end homelessness. The US Interagency Council on Homelessness promotes services integration and systems change to end homelessness. Its mission, by statute, is to coordinate the federal response to homelessness and create partnerships with the private sector and local governments to prevent and end homelessness. The council includes the heads of 19 federal agencies1 and elects a chair and vice chair annually from among its members. The current chair is Secretary Sylvia Mathews Burwell of the US Department of Health and Human Services, and the vice chair is Acting Secretary John B. King Jr. of the US Department of Education. Since its establishment in 1987, USICH has been subject to changing congressional and administrative priorities, losing its funding for six years before it was refunded in 2001. USICH has an annual budget of approximately $3.5 million. Under its current congressional authorization, USICH is scheduled to automatically sunset on September 30, 2017. What Are USICH's Key Contributions? In 2010, USICH released Opening Doors, the nation’s first comprehensive federal strategy to prevent and end homelessness. USICH created Opening Doors with unprecedented input from thousands of stakeholders, including practitioners, researchers, public officials, and people who have experienced homelessness. Federal agencies and hundreds of communities have adopted this plan, galvanizing coordinated action to end homelessness on specific timelines. USICH guided federal agencies and communities in applying research to practice to improve programs and systems by pushing to adopt housing-first models as a best practice and navigating difficult conversations to transform homeless services into crisis response systems. 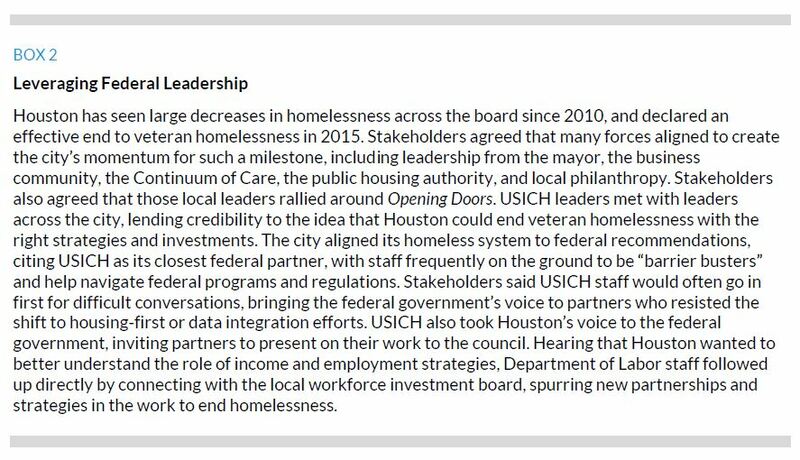 USICH was a leading thought partner in shifting policy priorities to fund what works for ending homelessness, resulting in reduced funding for less effective and more expensive strategies, such as transitional housing, and increased funding for permanent housing strategies. USICH led the creation of federal criteria and benchmarks for effectively ending veteran and chronic homelessness. Using this guidance, 26 communities and two states have put the necessary systems in place to meet the established benchmarks for effectively ending veteran’s homelessness.2 These milestones have shifted the conversation from managing homelessness to ending it, building momentum community by community. USICH created clear guidance on how federal resources, including such benefits as Supplemental Security Income, Social Security Disability Insurance, and Medicaid, can be leveraged to help end homelessness. How Are Efforts to End Homelessness Progressing? National and local stakeholders in the government, private, and nonprofit sectors across the country use Opening Doors as a road map to end and prevent homelessness. Agencies such as the US Departments of Education, Health and Human Services, Housing and Urban Development, Labor, and Veterans Affairs use it to guide the implementation of targeted federal homeless assistance programs. Hundreds of local governments have released plans to end homelessness that implement strategies identified in Opening Doors. Since 2010, the number of homeless people has declined 11 percent. The most progress was made with subpopulations: veteran homelessness declined 36 percent, chronic homelessness declined 22 percent, and family homelessness declined 15 percent (figure 1). The progress among homeless veterans is especially notable. Progress ending chronic homelessness appears to have tapered off recently. Homelessness isn’t decreasing everywhere. Some communities, where homelessness is rising rapidly, have declared homeless states of emergency. How Does USICH Facilitate National and Local Progress? Tasked with coordinating the federal response to homelessness, USICH is perceived as uniquely positioned to help federal, state, and local actors achieve the nation’s ambitious goals. 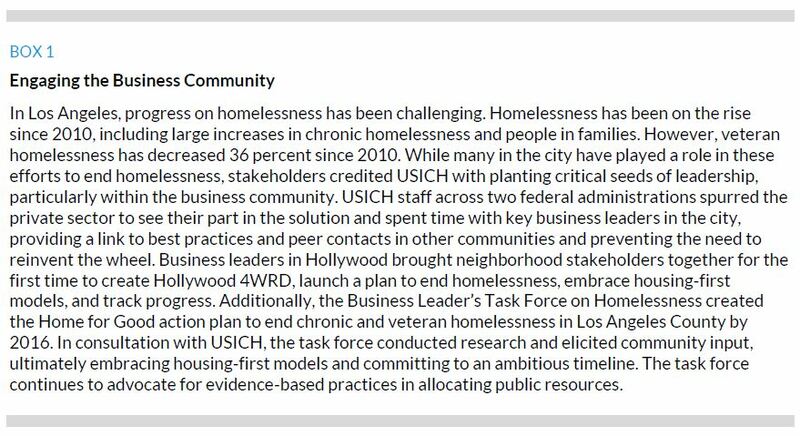 Overwhelmingly, stakeholders across all sectors and levels of government identified USICH as part of a highly effective performance-driven partnership to end homelessness. USICH brought together partners who had never worked together because of various forces that kept work in silos. Many stakeholders pointed to USICH as a model of interagency collaboration, with a focus on evidence and results that led to key successes. Stakeholders commonly discussed five components of USICH’s role. The assessment’s two case studies also illustrate USICH’s role in the successes and challenges of Houston and Los Angeles. Cabinet-level leadership routinely attend USICH’s quarterly council meetings. USICH regularly convenes national advocates for coordination and input. Strong USICH messaging on the cross-sector response to homelessness led to the formation of local homelessness task forces (box 1). USICH brought the Departments of Defense and Veterans Affairs together to plan for “warm handoffs” of transitioning military service members, ensuring housing stability. Based on USICH guidance, communities worked to overlap Housing and Urban Development data systems (Homeless Management Information System) and Veterans Affairs data systems (Homeless Management Evaluation System) to produce a shared list of veterans who most need housing assistance. Communities model local action to reflect federal priorities and credited USICH with bringing credibility to difficult decisions to shift policy and funding priorities to align with best practices, such as housing-first models. In turn, USICH facilitates a feedback loop to federal agencies to understand how policies are implemented on the ground, creating a collection of best practices and highlighting necessary federal changes (box 2). Various agencies have been working on homelessness issues for decades, but many view the urgency and focus that came to the work after Opening Doors, especially the focus on regularly measuring progress, as the crucial factor in progress made since 2010. Communities credit USICH with unprecedented access to federal staff, resulting in unique clarity and alignment in the work to end homelessness. Agencies credit USICH with helping maximize federal resources by clarifying the role of federal programs, including Supplemental Security Income and Social Security Disability Insurance, Temporary Assistance for Needy Families, housing vouchers, and Medicaid, to best serve people experiencing homelessness. For example, USICH facilitated the joint release of guidance from the Social Security Administration, Veterans Affairs, and Substance Abuse and Mental Health Services Administration to connect people experiencing homelessness to Supplemental Security Income and Social Security Disability Insurance benefits. Communities cite USICH’s Supportive Housing Opportunities Planner Tool and the benchmarks and criteria for ending homelessness in generating cross-sector investment in local homeless response systems. What Are the Potential Effects of USICH's Planned Termination in 2017? USICH has helped change the conversation from managing homelessness to ending it. Given the successes of USICH and its partners so far, many stakeholders are looking to the even tougher work ahead, tackling homelessness for populations like youth and families, and ultimately the lack of affordable housing and persistent poverty that leads to homelessness. To continue achieving results, stakeholders overwhelmingly believe USICH should continue as a key partner, maintaining critical federal infrastructure for the work. Stakeholders believe the work to end homelessness would continue without USICH, citing the full buy-in the work has had at all levels. However, they also noted various ways that terminating USICH would slow efforts to end homelessness and weaken the collective movement. Agencies said they would continue collaboration, but without USICH to ensure quality and consistency, the value would decrease and results would suffer. Agencies believe USICH and the cabinet-level leadership that guides it motivate federal staff to collaborate, and without such leadership, staff urgency and focus would wane. Agencies argue that locating the functions of USICH within one member agency would compromise the independence necessary to convene agencies and negotiate commitments to common goals. Member agencies also do not have the staff capacity to fulfill USICH’s role. Federal stakeholders also saw USICH’s potential termination as a signal to those who work on homelessness that ending homelessness is not a federal priority. Community stakeholders believe their burden would increase by having to independently seek out best practices and navigate relationships with federal stakeholders. Local stakeholders worry that bold goals and policy shifts would be perceived as politically driven or in support of an agency’s agenda, rather than part of a national plan to end homelessness. Communities fear the lack of leadership and local presence of USICH staff would cause confusion, resulting in less efficient use of federal funds. At all levels, stakeholders said USICH has played a major part in the successes since 2010, and the same results could not be expected without USICH. Further, USICH has shown that with effective federal infrastructure, interagency collaboration can be a key factor in good government and cast a vision for ending other social problems no one thought solvable. Gubits, Daniel, Marybeth Shinn, Stephen Bell, Michelle Wood, Samuel Dastrup, Claudia D. Solari, Scott R. Brown et al. 2015. Family Options Study: Short-Term Impacts of Housing and Services Intervention for Homeless Families. Washington, DC: US Department of Housing and Urban Development, Office of Policy Development and Research. Henry, Meghan, Azim Shivi, Tanya de Sousa, and Rebecca Cohen. 2015. 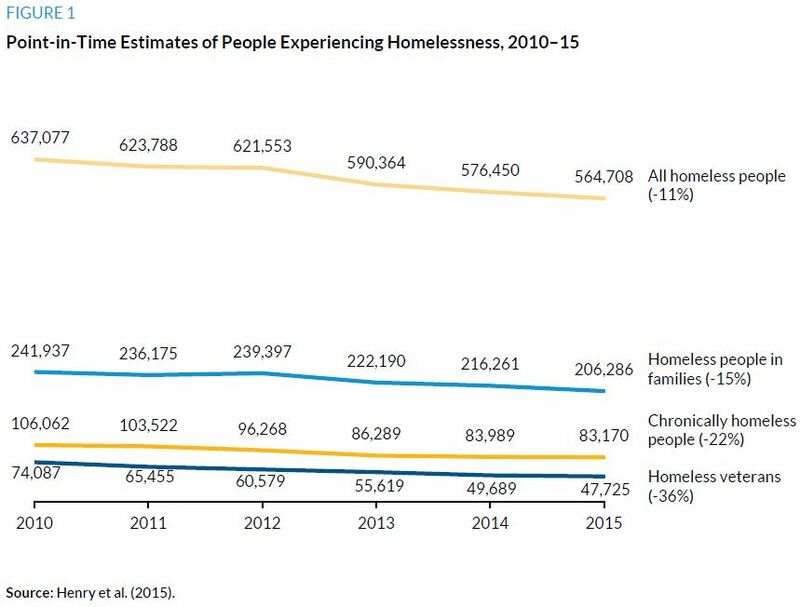 The 2015 Annual Homeless Assessment Report (AHAR) to Congress Part 1: Point-in-Time Estimates of Homelessness. Washington, DC: US Department of Housing and Urban Development, Office of Community Planning and Development. USICH (US Interagency Council on Homelessness). 2015. The President’s 2016 Budget: Fact Sheet on Homelessness Assistance. Washington, DC: USICH. Sarah Gillespie is a research associate in the Metropolitan Housing and Communities Policy Center at the Urban Institute. Her research focuses on housing and homelessness, place-based initiatives, and performance measurement. She is project director for a five-site national evaluation of supportive housing for families involved in the child welfare system, and an evaluation of a supportive housing social impact bond for frequent users of the criminal justice system in Denver. Mary Cunningham is a senior fellow in the Metropolitan Housing and Communities Policy Center. Her research focuses on homelessness, housing instability, and concentrated poverty. Cunningham leads studies examining the impact of housing vouchers on child welfare involvement, the impact of supportive housing on high-need families in the child welfare system, and outcomes from a homeless prevention program for at-risk veterans. This brief was funded by the Conrad N. Hilton Foundation, Melville Charitable Trust, Bill & Melinda Gates Foundation, Kresge Foundation, and Butler Family Fund. We are grateful to them and to all our funders, who make it possible for Urban to advance its mission. The authors would like to thank Fiona Blackshaw and David Hinson for excellent editorial work on this brief; it benefited greatly from their talents. We also thank Harry Hatry and Josh Leopold for insightful comments on earlier drafts, and Marge Turner, who provided careful technical review to ensure the brief meets Urban’s high standards for quality and independence.